Dental Coupons. Los Angeles Dentist. Z Dental Group is a Cosmetic and Implant, Green Dentist in Beverly Hills. Give the gift of the smile to your loved one. 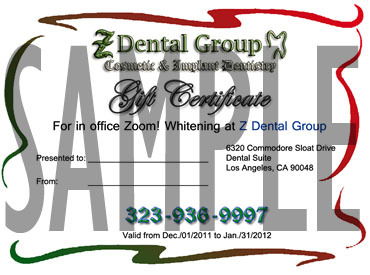 Z Dental Group is offering a Dental Gift Certificate for Zoom In Office Whitening. A Gift Of Smile is the most precious thing that one could offer. And all of us at Z Dental Group are happy for the opportunity to become a part of your gift. Call us for details and we will email you the customized gift certificate that you can print and present to a friend, family member or your significant other.